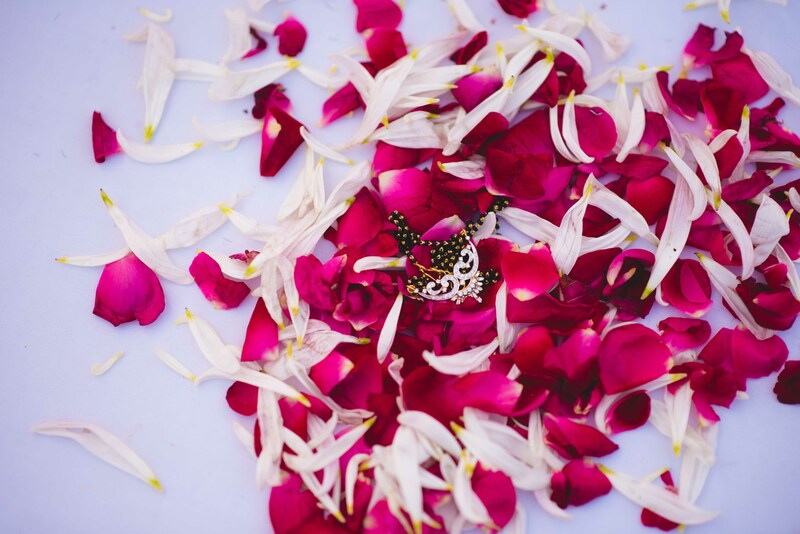 Today’s wedding feature has literally taken our breath away. 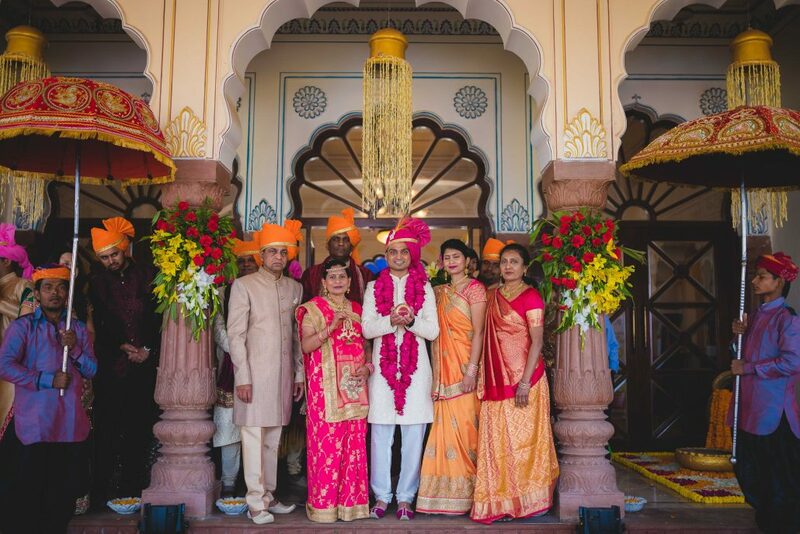 We have been transported to the land of the maharajah’s to celebrate gorgeous couple, Nidhi and Arpan’s three day wedding at the magnificent Pratap Niwas. 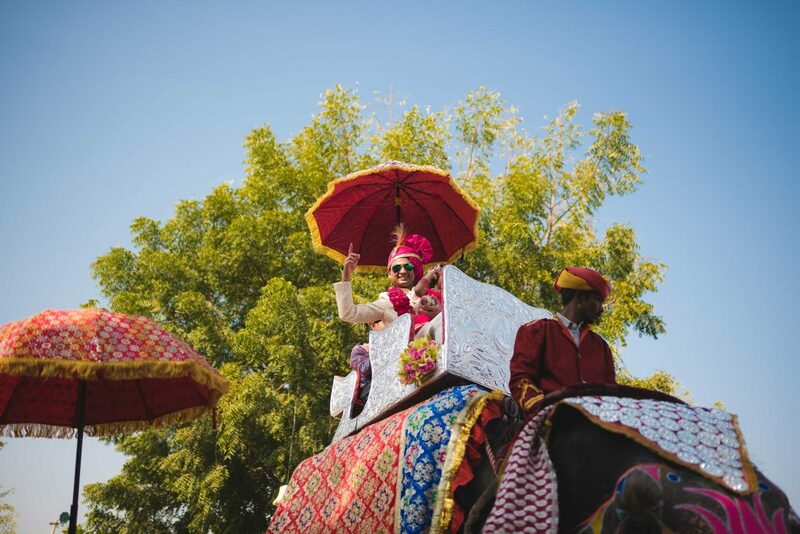 Maharanis, this is a celebration truly fit for Rajasthani royalty and wait till you view the feature film! 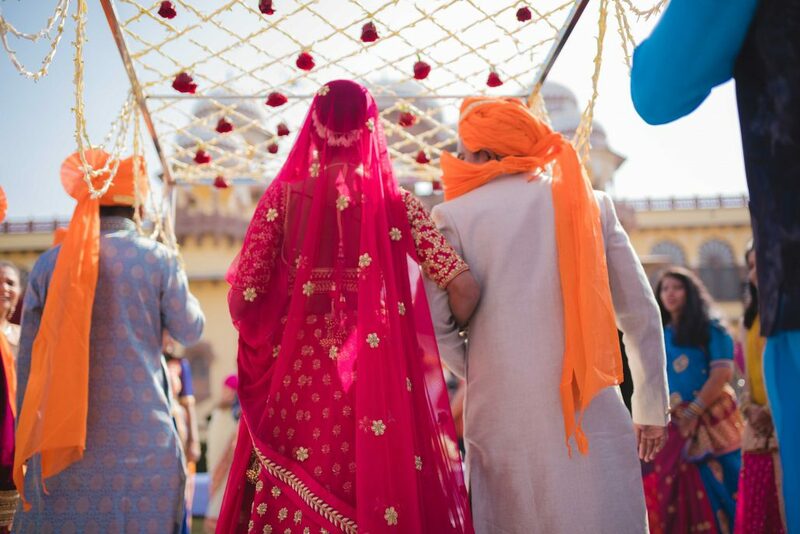 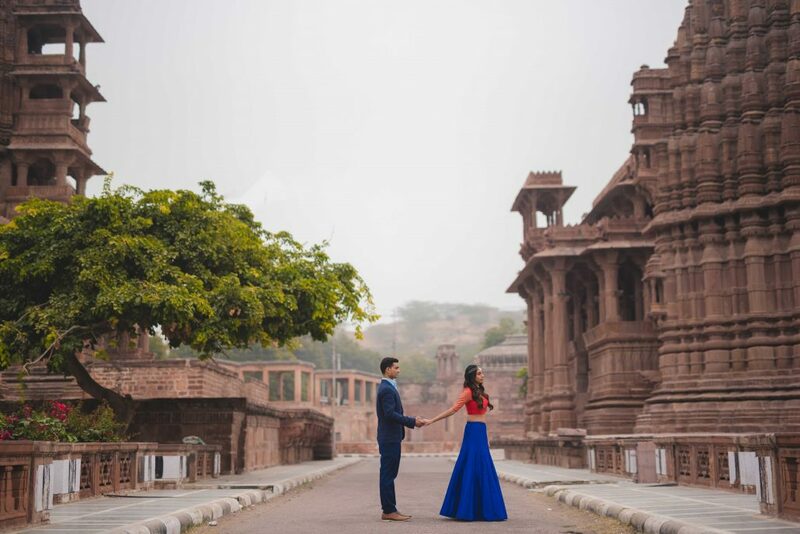 Philadelphia couple, Nidhi and Arpan wed on 4th January this year in majestic Jodhpur, and styled their celebrations with classy and colourful touches against palace backdrops. 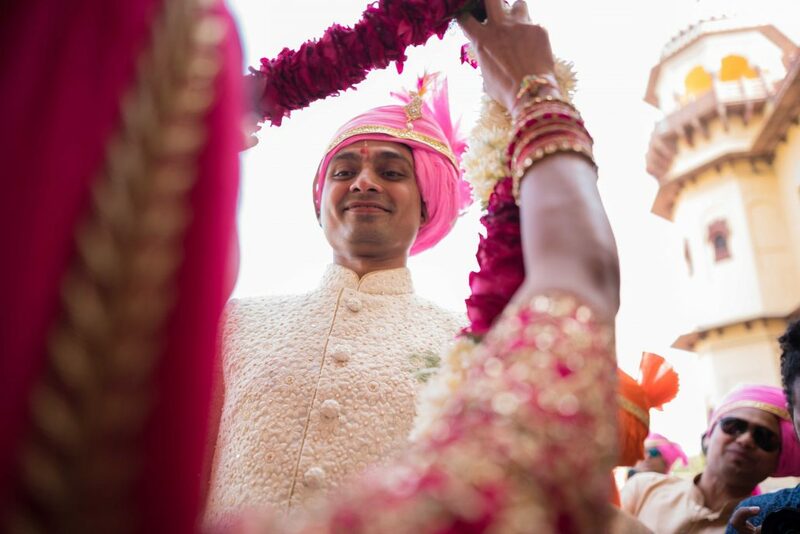 They enlisted the services of ace wedding photographer/cinematographer, Anuraag Rathi to document their celebrations. 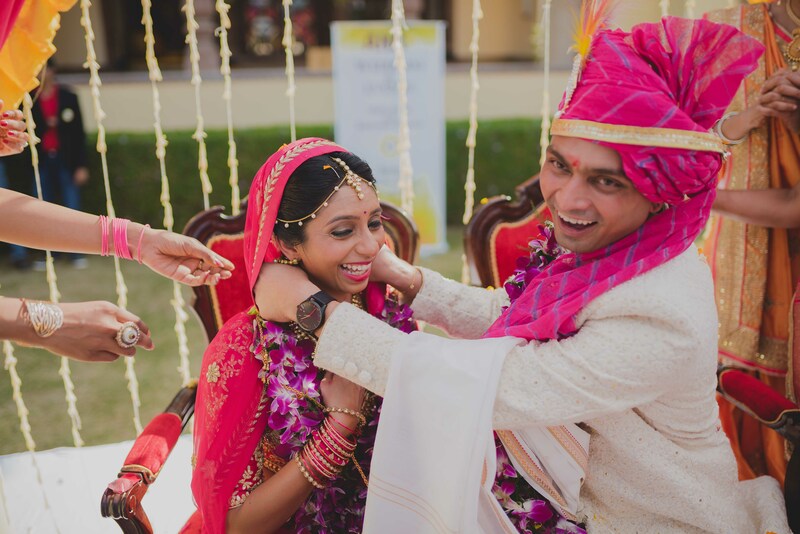 The couple knew each other since childhood, but love only blossomed during their undergrad days. 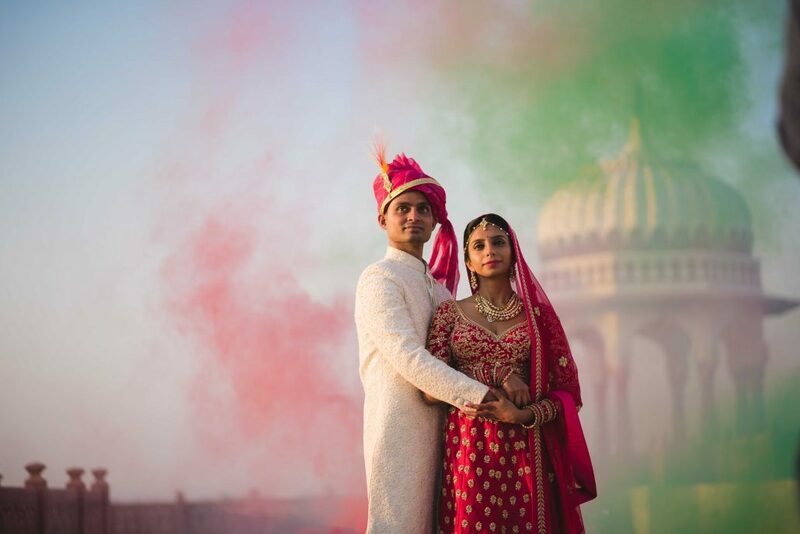 For both of them, there was no question about choosing India as the wedding destination. 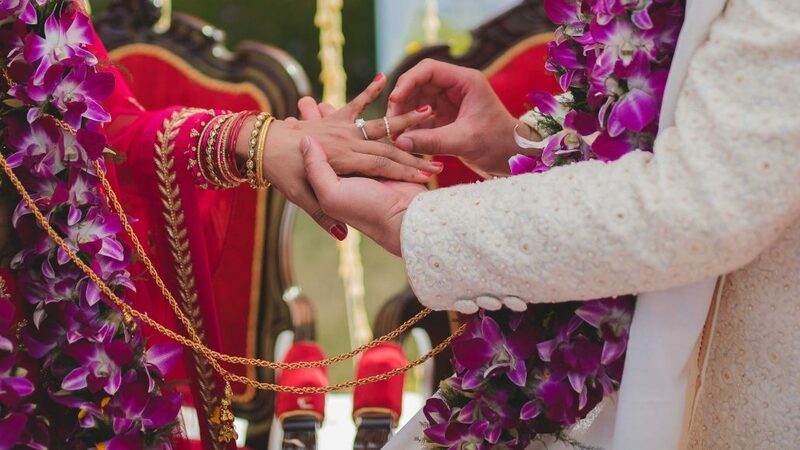 Despite shortlisting cities like Kerala, Goa and Udaipur, it seems that bride Nidhi’s traditional palace wedding idea was the winner in the end. 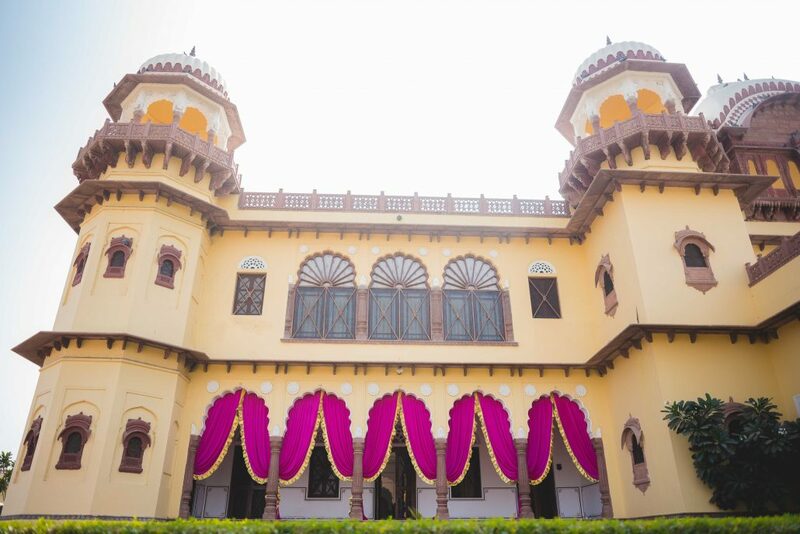 It was the Mughal architecture and old world charm of Pratap Niwas in Jodhpur that captured their hearts. 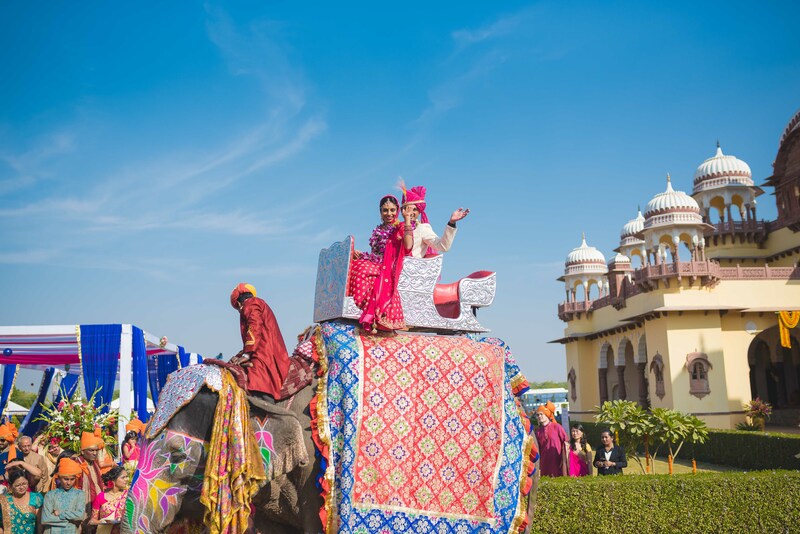 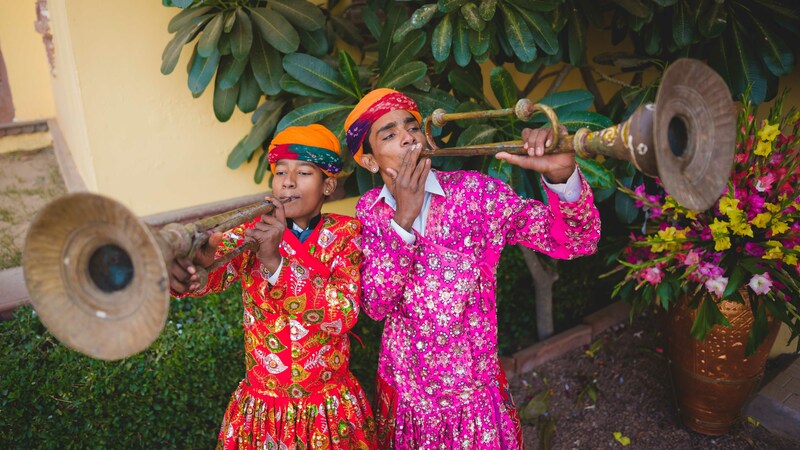 The intimate three day affair was held at two different hotels in the stunning blue city of Jodhpur, Rajasthan, and styled their celebrations with vibrant décor. 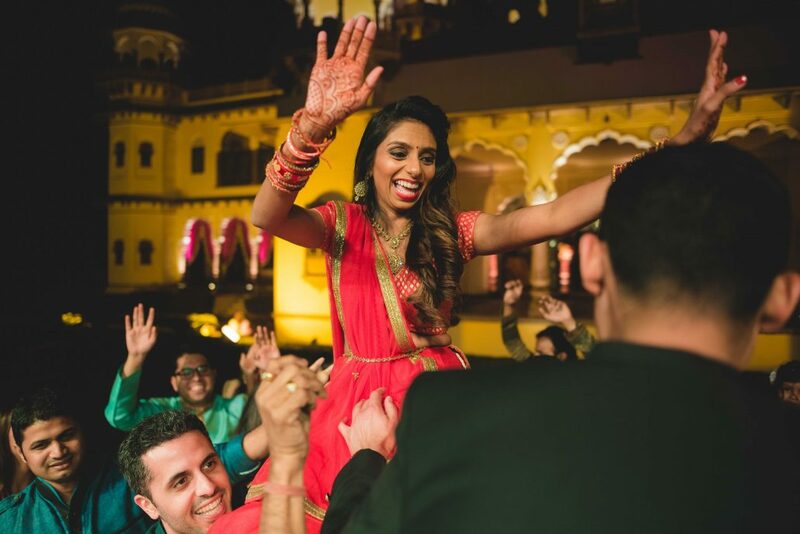 Bride Nidhi gave us a brief run down of the events over the course of the three days. 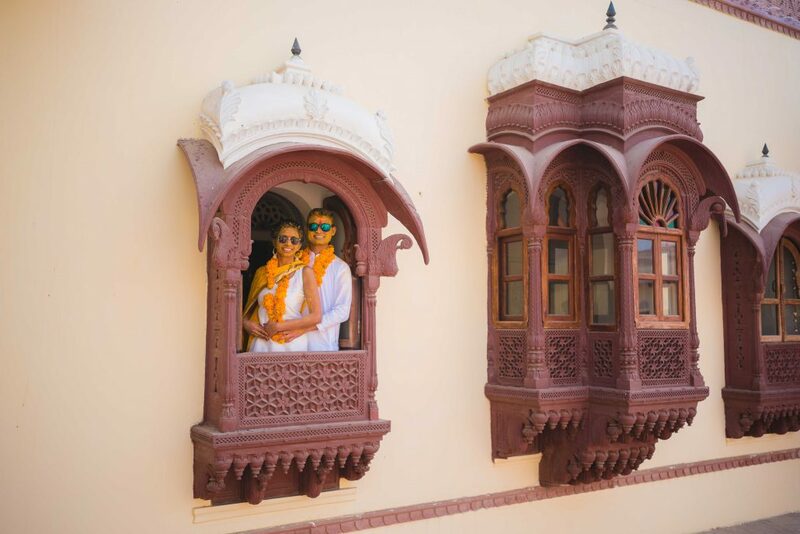 We kicked off our wedding celebrations on new years eve hosted at Ranbanka Palace, an iconic royal palace in Jodhpur with our friends. 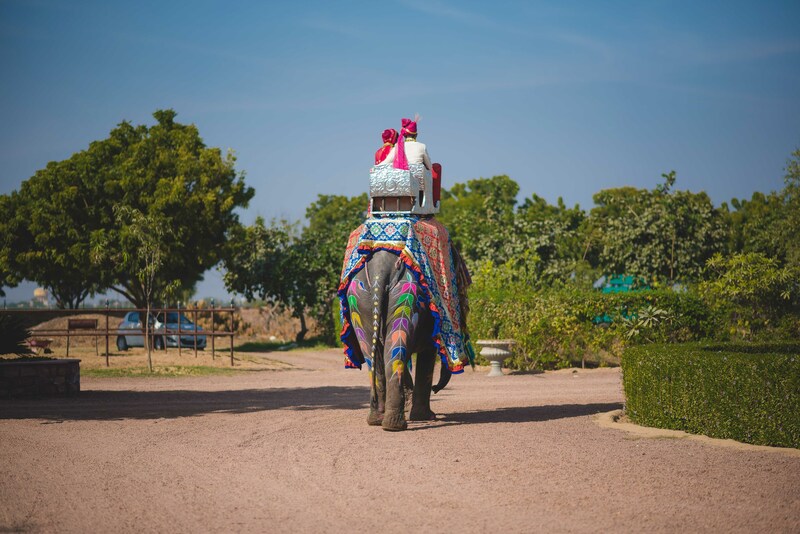 The ‘Welcome to Marwar Lunch’ event was a vibrant and colourful Rajasthani welcome with flowers, Rajasthani live instrumental music, camels and decor. 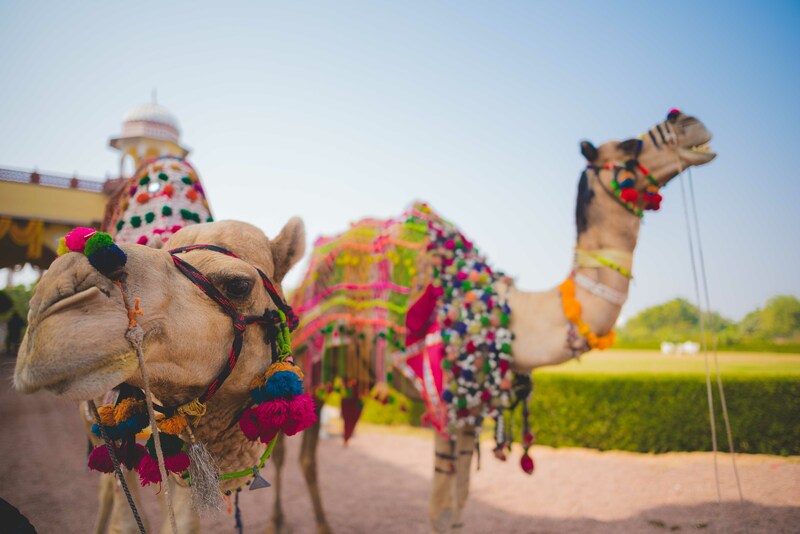 For our Mehndi party, we went all Moroccan at Jhalamand Garh Palace. 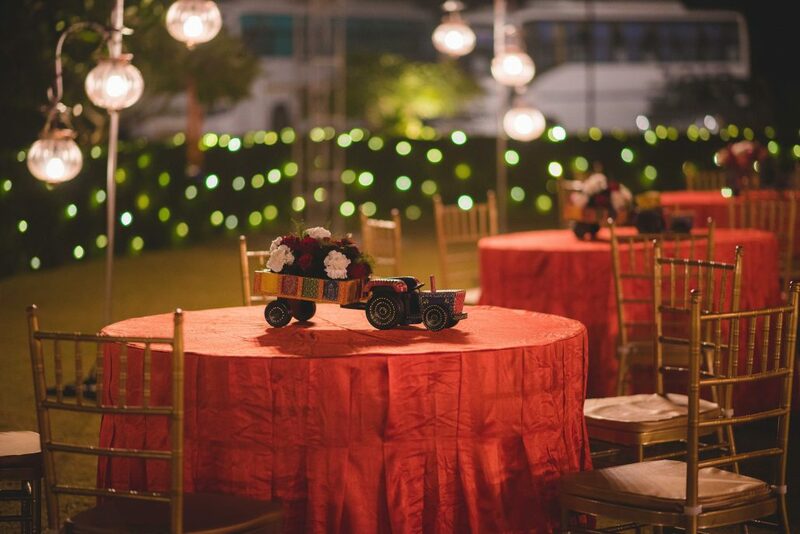 The floating lanterns in the pool and fairy lights added a nice touch and enhanced the overall ambience. 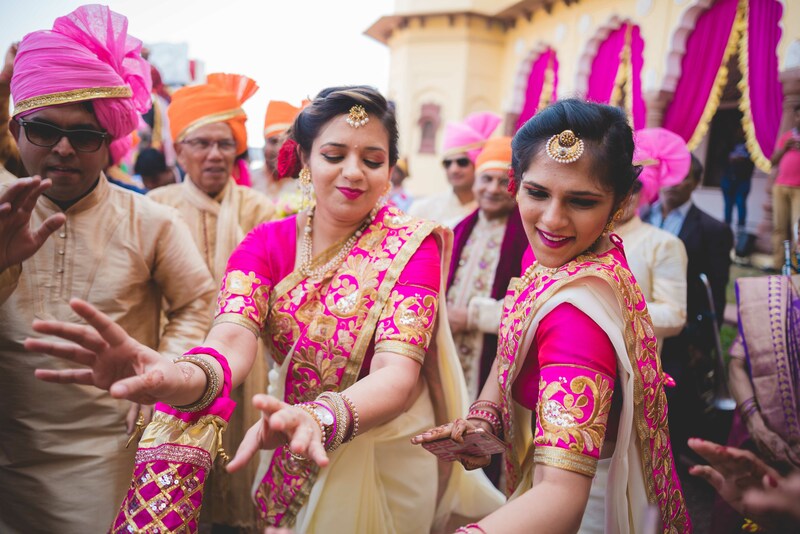 We also had games, folk dancers plus an open bar! 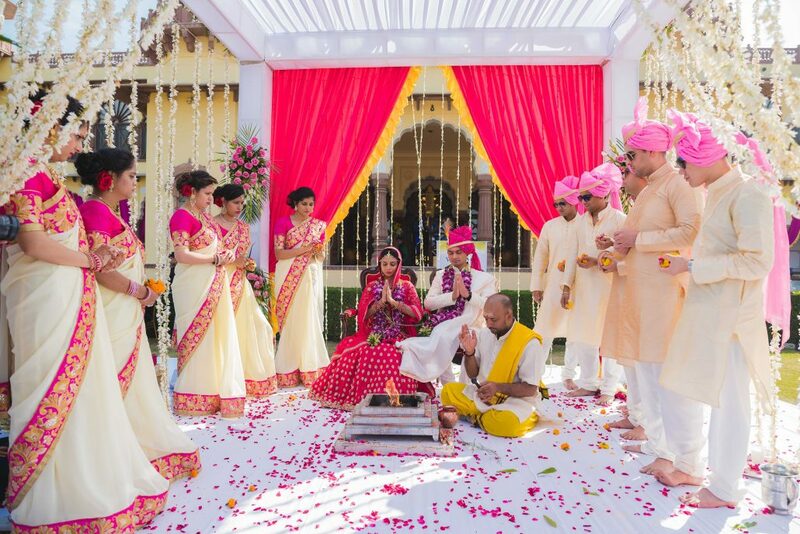 The Haldi ceremony was enhanced by yellow and red décor all around pool with a traditional Rajasthani sit down lunch. 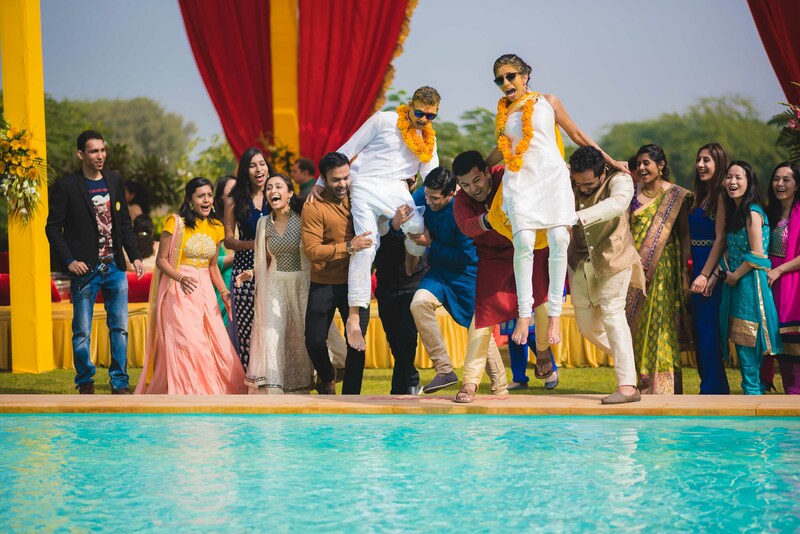 Honestly, this turned out to be most enjoyable event as both our family and friends took part in the festivities and also applied haldi and to top it all off, there was a surprise throw into a pool courtesy of our friends! 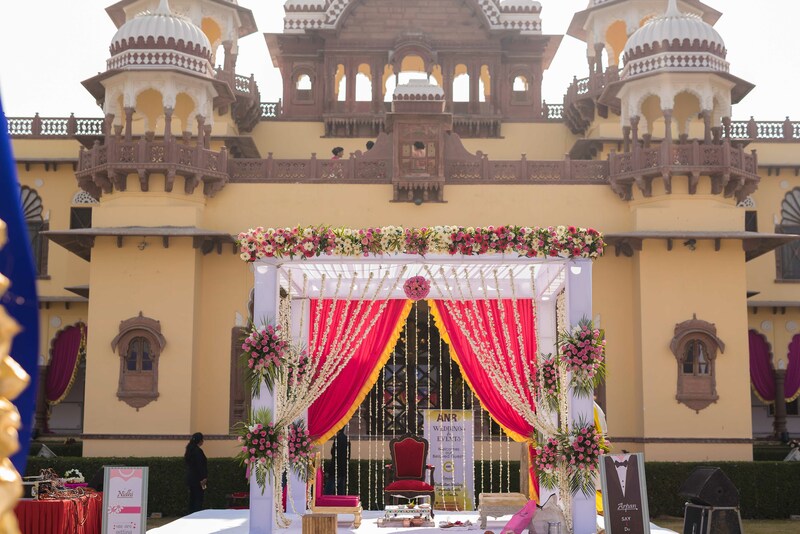 The Sangeet party was a Gujarati garba theme featuring classy décor, which included red and white drapes, a standing chandelier and diya lights, all set against a beautifully lit palace backdrop. 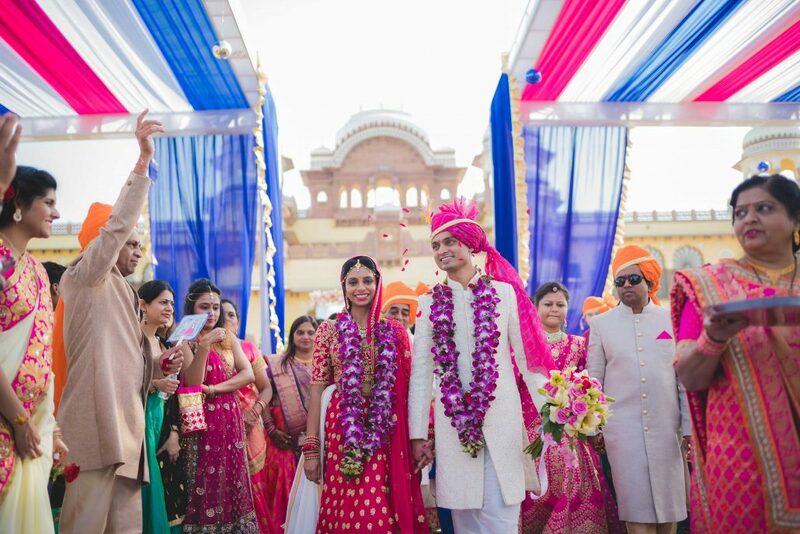 Last but not least was our wedding and reception. 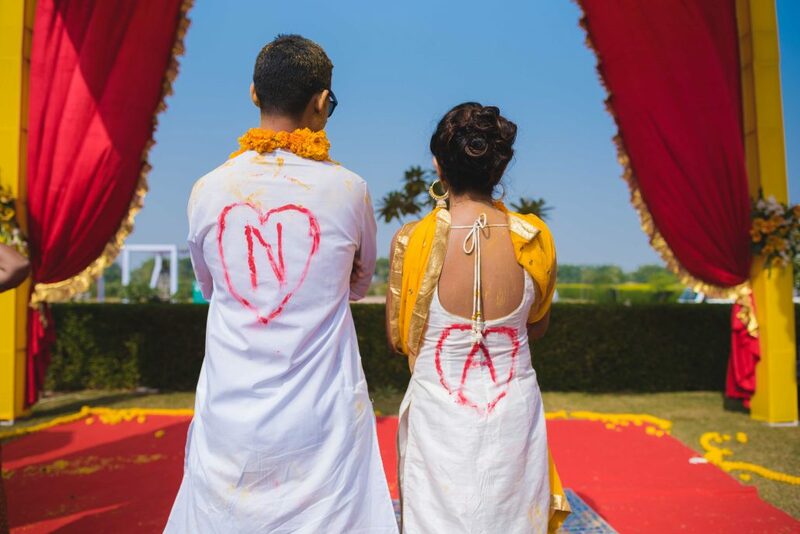 Our wedding was minimalistic with traditional touches. 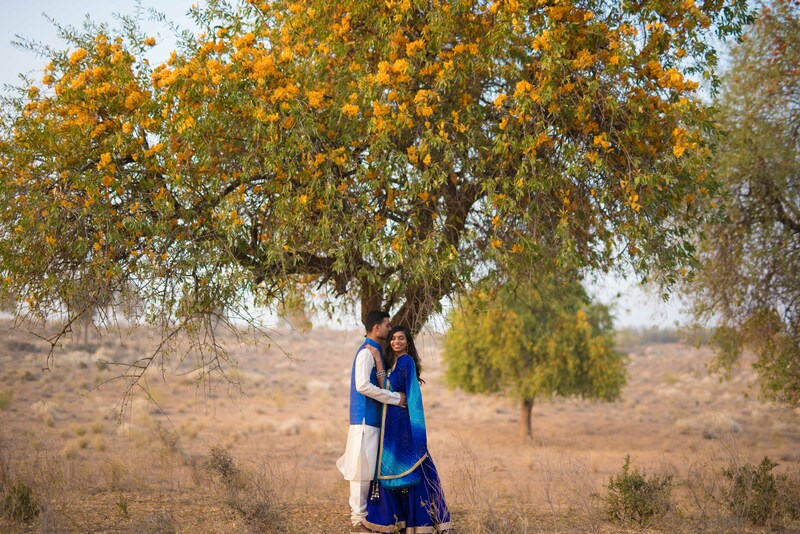 It was picture perfect. 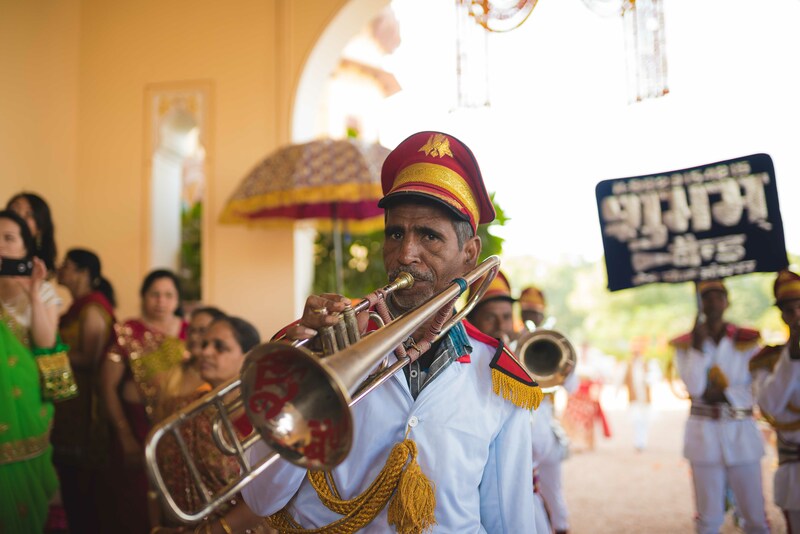 We had band, baaja and fanfare with a majestic elephant and subtle white and pink floral accents. 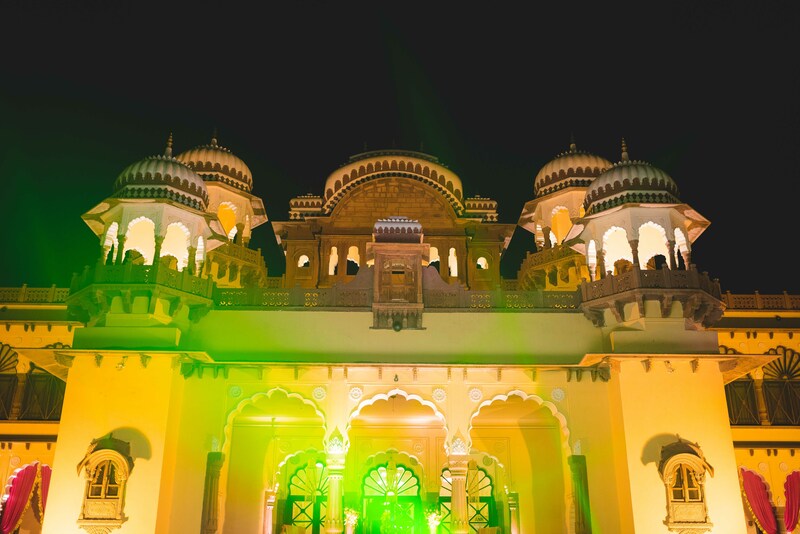 The beautiful courtyard of Pratap Niwas palace was where we played host for the reception. 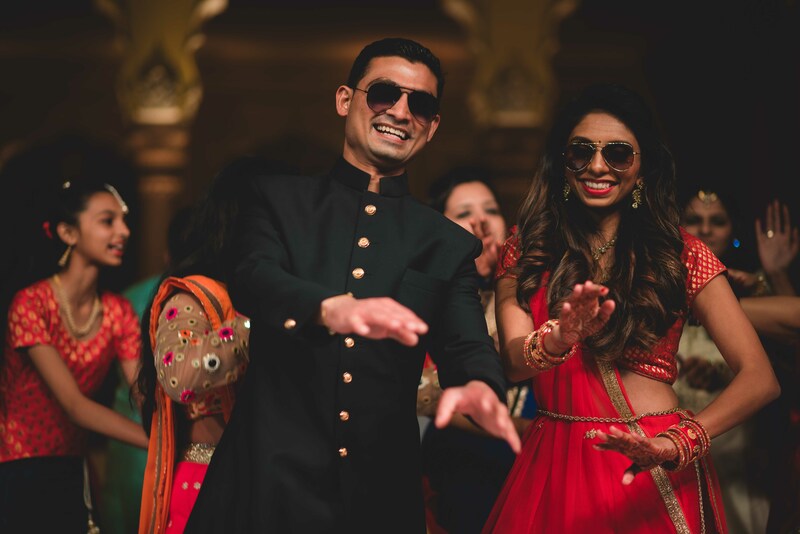 The main thing was to ensure our guests felt comfortable the whole time with unlimited food and drinks. 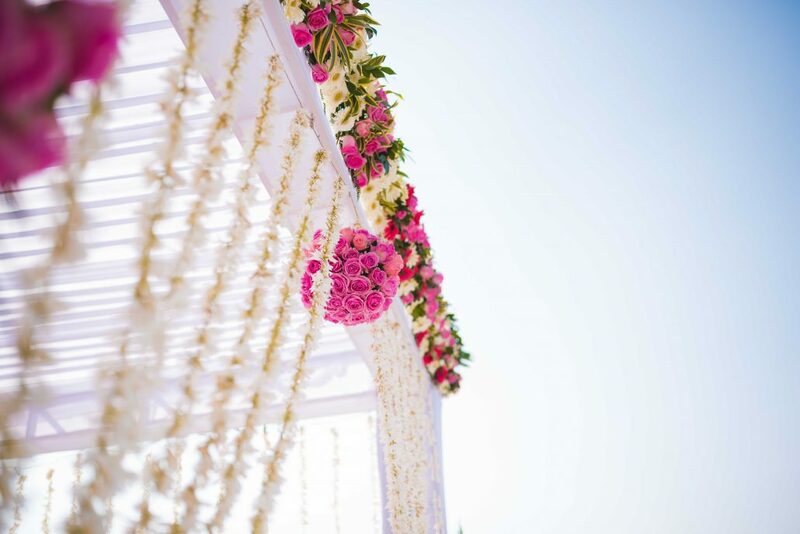 We just adore the attention and stunning decor details. 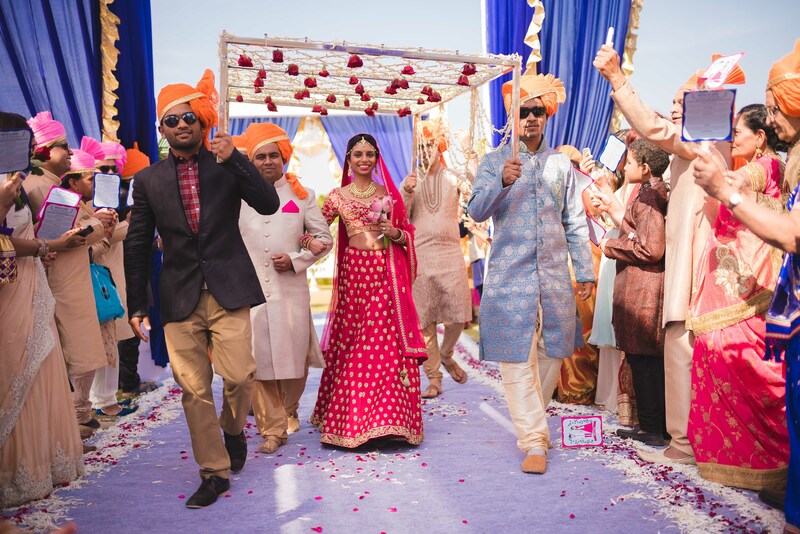 Nidhi and Arpan left no stone unturned and full marks on hosting an epic celebration. 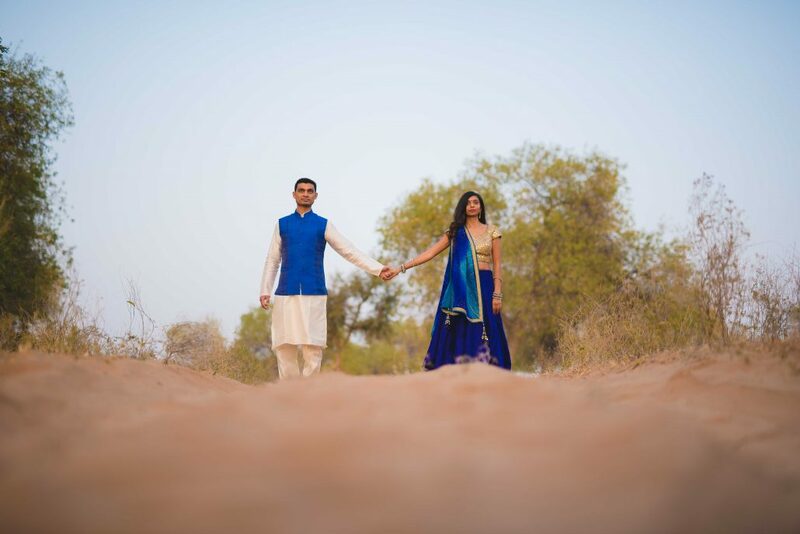 Nidhi and Arpan have only two key pieces of advice for future couples and that is, to plan ahead and enjoy the day. 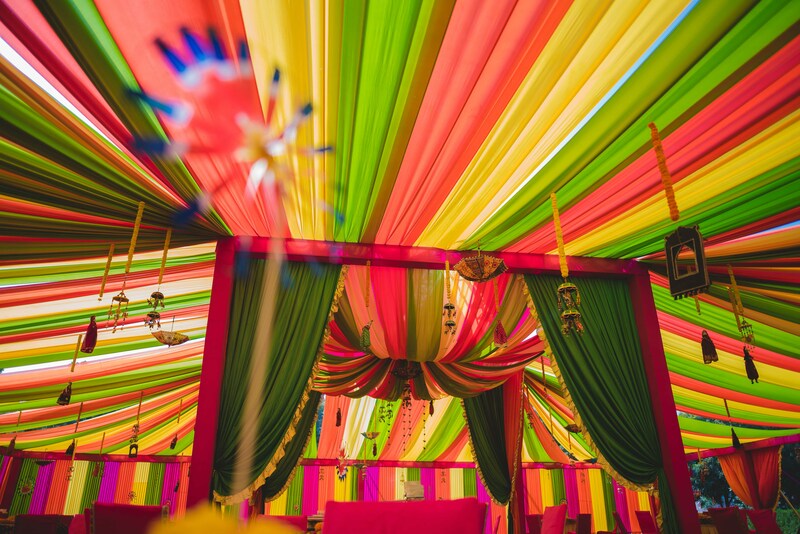 Some wise words there! 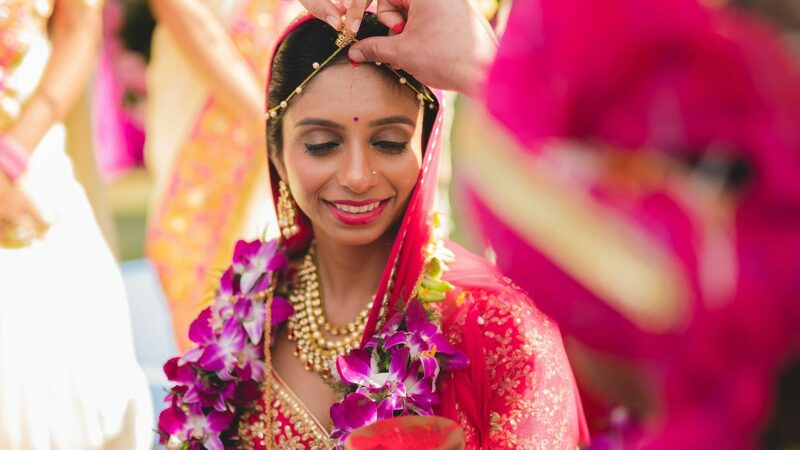 Thank you so much for sharing your beautiful wedding festivities with us. 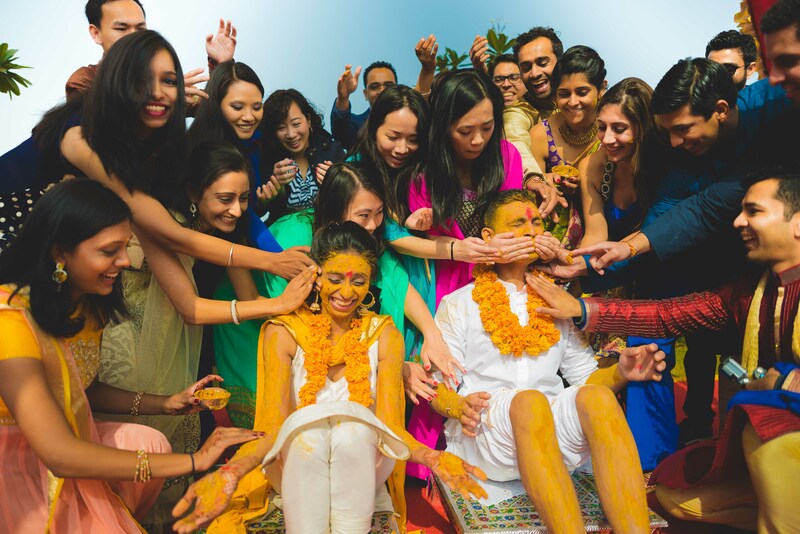 We wish you all the best for the future, Nidhi and Arpan. 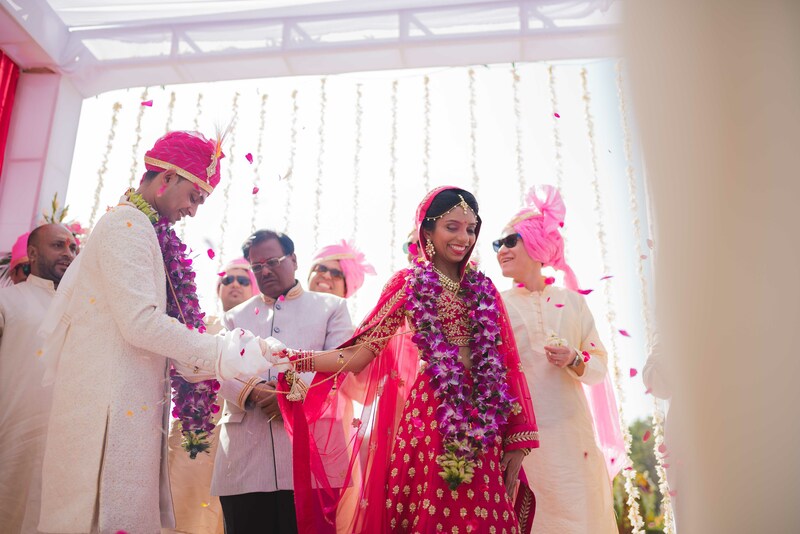 What a great start to 2018! 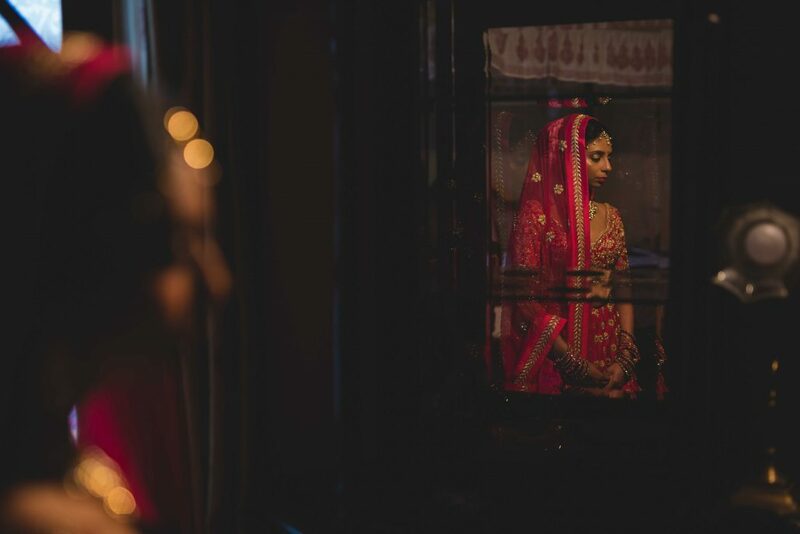 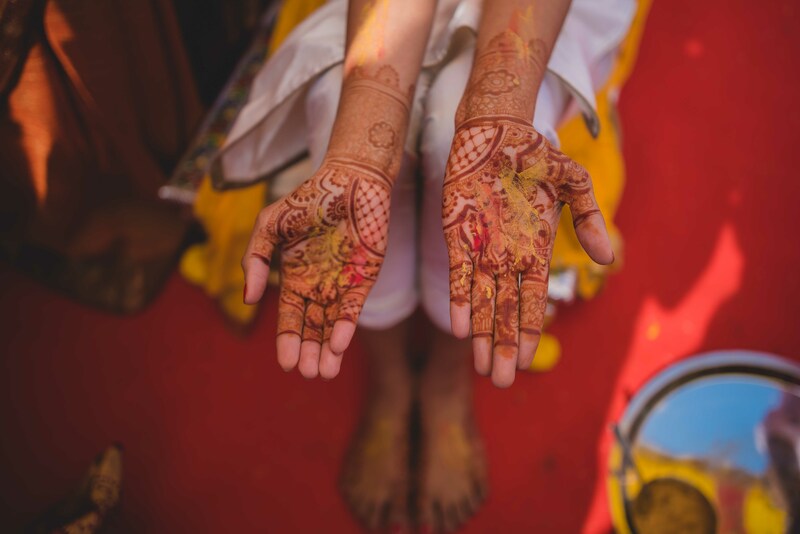 Our thanks goes to Anuraag Rathi for sharing these beautiful photographs and feature wedding film.